The next issue of CPI-IW for the month of August, 2016 will be released on Friday, 30th September, 2016. The same will also be available on the office website www.labourbureaunew.zov.in. 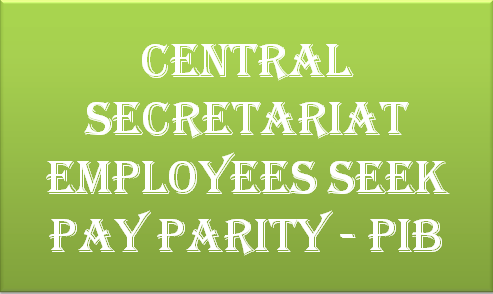 Subject: Grant of Productivity Linked Bonus (PLB) and non-productivity Linked Bonus (Ad-hoc bonus) in case of Central Government employees for the accounting year 2014-15 – enhancement of the calculation ceiling- Regarding. The undersigned is directed to invite attention to this Ministry’s 0M No.7/24/2007/E-lll.A dated regarding grant of non-productivity Linked Bonus (Ad-hoc Bonus) to the Central Government employees for the accounting year 2014-2015, whereby the calculation ceiling for the purpose of payment of ad-hoc bonus was monthly emoluments of Rs.3500. The Productivity Linked Bonus (PLB) in case of Central Government employees working under certain Ministries/Departments, where such PLB was in operation in 2014-15, was also paid by the respective Ministries/Departments for the accounting year 2014-15 based on the concurrence of this Ministry with the calculation ceiling at monthly emoluments of Rs. 3500. 2. The question of enhancement of the calculation ceiling for the purpose of payment of PLB and non-PLB (ad-hoc bonus), as the case may be, to the Central Government employees has been considered and the President is pleased to decide that the calculation ceiling of monthly emoluments for the purpose of payment of PLB and ad-hoc bonus, as the case may be, shall be revised to Rs.7000 w.e.f. 01.04.2014, i.e., for the accounting year 2014-15. 3. 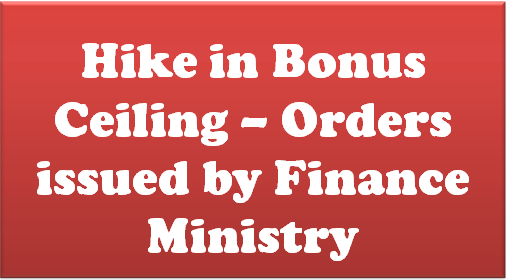 Accordingly, the PLB or ad-hoc bonus, as the case may be, as already paid to the eligible Central Government employees for the accounting year 2014-15 in terms of the above 0M dated 16.10.2015 pertaining to ad-hoc bonus and the respective sanctions issued by the concerned Ministries/Departments in respect of PLB under the respective schemes in operation during 2014-15 based on the specific concurrence of this Ministry, shall be re-worked out based on the calculation ceiling of monthly emoluments of Rs.7000 instead of Rs.3500. 4. While re-working out payment of PLB or ad-hoc orders, as the case may be, under these orders for the accounting year 2014-15, all the other terms and conditions under which the payment was made shall remain unchanged. 5. In respect of their application to the employees working in the Indian Audit and Accounts Departments, these orders are issued in consultation with the office of the Comptroller and Auditor General of India. 6. Hindi version of this order will follow. The Social Justice Ministry is working on a proposal to raise the annual income ceiling of OBCs to Rs 8 lakh, according to official sources. 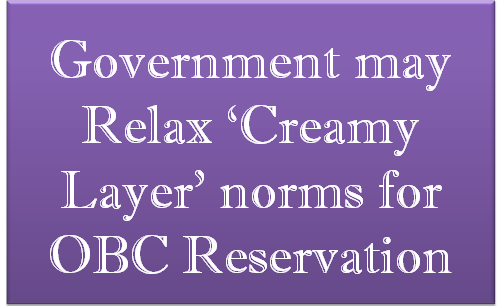 With a large number of vacancies in government jobs meant for Other Backward Classes (OBCs) remaining unfilled for want of candidates, the government is mulling relaxing the ‘creamy layer’ criterion by raising the income ceiling to Rs 8 lakh annually. 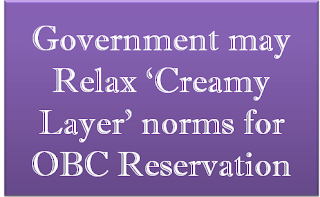 Almost 27 per cent of seats in government jobs and educational institutions are reserved for OBCs provided the annual income of the family is up to Rs 6 lakh and those who earn above that are referred to as the ‘creamy layer’ and are not eligible for reservation. Raising the ceiling would result in a larger pool of candidates eligible for government jobs and seats in educational institutions. The Social Justice Ministry is working on a proposal to raise the annual income ceiling of OBCs to Rs 8 lakh, according to official sources. A Cabinet note is likely to be moved in this regard soon, they said. When contacted National Comission for Backward Classes (NCBC) Member Ashok Saini told media that the panel had recommended more than doubling the income ceiling to Rs 15 lakh. “Even two decades after reservation (was introduced), out of 27 per allocated quota, it has been seen that only 12-15 per get utilised. As per our analysis, the major reason behind this is the ceiling on annual income,” Saini said. As per Mandal Comission report, in 1980 OBCs constituted 52 per cent of India’s population. The panel’s report was based on the 1931 census. The National Sample Survey Organisation had in 2006 pegged the OBC population at 41 per cent. New De1hi-110 003, Dated the 26 August, 2016. 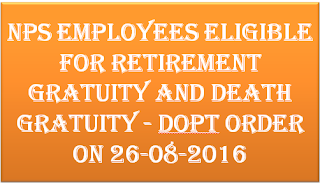 Subject : Extension of benefits of ‘Retirement Gratuity and Death Gratuity’ to the Central Government employees covered by new Defined Contribution Pension System (National Pension System) — regarding. The undersigned is directed to say that the pension of the Government servants appointed on or after 1.1.2004 is regulated by the new Defined Contribution Pension System (known as National Pension System), notified by the Ministry of Finance (Department of Economic Affairs) vide their OM No.5/7/2003-ECB & PR dated 22.12.2003. Orders were issued for payment of gratuity on provisional basis in respect of employees covered under National Pension System on their retirement from Government service on invalidation or death in service, vide this Department’s OM No.38/41/2006-P&PW(A) dated 5.5.2009. 2. The issue of grant of gratuity in respect government employees covered by the National Pension System has been under consideration of the Government. 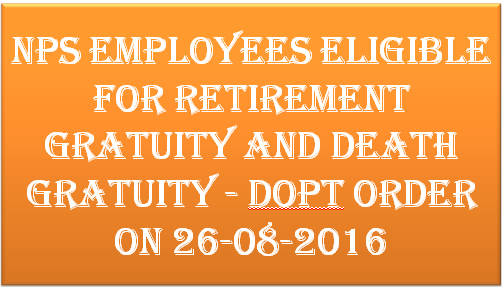 It has been decided that the government employees covered by National Pension System shall eligible for benefit of ‘Retirement gratuity and Death gratuity’ on the same terms and conditions, as are applicable to employees covered by Central Civil Service (Pension) Rule,1972. 3. These orders issue with the concurrence of Ministry of Finance, Department of Expenditure, vide their I.D. Note No.1(4)/EV/2006-II dated 29.07.2016. 5. These orders will be applicable to those Central Civil Government employees who joined Government service on or after 1.1.2004 and are covered by National Pension System and will take effect from the same date i.e. 1.1_2004. Central Civil Services (Classification, Control and Appeal) Rules, 1965 – Instructions regarding Timely Issue of Charge-Sheet – Regarding. Subject: Central Civil Services (Classification, Control and Appeal) Rules, 1965 – instructions regarding timely issue of Charge-sheet – regarding. 2. In compliance of the above judgement, it has been decided that where a Government servant: is placed under suspension, the order of suspension should not extend beyond three months, if within this period the charge-sheet is not served to the charged officer. As such, it should be ensured that the charge sheet is issued before expiry of 90 days from the date of suspension. As the suspension will lapse in case this time line is not adhered to, a close watch needs to be kept at all levels to ensure that charge sheets are issued in time. 3. It should also be ensured that disciplinary proceedings are initiated as far as practicable in cases where an investigating agency is seized of the matter or criminal proceedings have been launched. Clarifications in this regard have already been issued vide O.M. No. 11012/6/2007-Estt.A-Ill dated 21.07.2016. 4. All Ministries/ Departments/Offices’ are requested to bring the above guidelines to the notice of all Disciplinary Authorities under their control. New Delhi, dated 22nd August, 2016. The undersigned is directed to refer to Department of Personnel & Training’s O.M. No.12011/ 03/ 2008-Estt. (Allowance) dated 2nd September, 2008 and subsequent clarifications issued from time to time on the subject mentioned above and to say that E-Receipts produced by Central Govt. employees as a proof of payment of fee, etc., may be treated as original and hence may be allowed for claiming reimbursement of CEA. Clarification on admissibility of Transport Allowance in the cases where the officers are drawing Grade Pay of Rs. 10,000/- in PB-4 — regarding. 2. 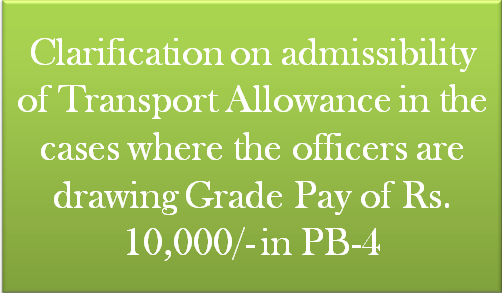 Several references have been received in this Department seeking clarification on the admissibility of Transport Allowance to officers drawing Grade Pay Rs. 10000/- under Dynamic ACP Scheme or NFU Scheme, A few cases have also been filed in the Courts in this regard. Hon’ble Central’ Administrative Tribunal (CAT), Principal Bench, New Delhi, in Order dated 13.05.2014 in O.A. No.4062/2013 filed by Shri Radhacharan Shakiya & Others V/S union of India & Others, held that the Applicants were not entitled to draw Transport Allowance @ Rs.7,000/. p.m. plus DA thereon. The said order of the Tribunal has also been upheld by Hon’ble High Court of Delhi in their Order dated 03.09.2014 passed in writ petition (Civil) NO. 3445/2014, filed by Shri Radhacharan Shakiya & Others. 3. Accordingly, it is clarified that the officers, who are not entitled for the use of official car for commuting between residence to Office and back, in terms of DoE’s OM 20(5)/E-II(A)/93 dated 28-01-1994, are not eligible to opt for drawal of Transport Allowance @ Rs.7000/- p.m. + DA thereon, in terms of DoE’s O.M, No.21(2)/2008-E.II(B) dated 29.08 2008, even though they are drawing Grade pay of Rs. 10,000/- in PB-4 under Dynamic ACP Scheme or under the scheme of Non Functional Upgradation (NFU). 1. 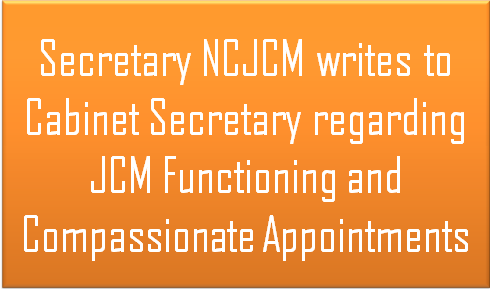 JCM functioning – Non convening of meetings at the Departmental levels, consequent non availability of a forum for discussion and negotiations for Unions / Federations. 2. Compassionate Appointments in Departments other than Railways. 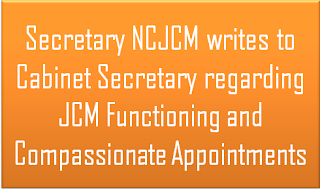 The functioning of the JCM especially at the Departmental level was virtually halted, when the Government promulgated a new set of recognition rules in 1993 to cover the non-industrial employee’s i. e. for employees in the Department other than Railways and Defence. It took nearly a decade and half to operationalize the new recognition rules and during the same period the functioning of JCM was virtually stopped at the departmental levels. This’ in-turn resulted in non-discussion and non-settlement of various Departmental specific demands and issues, emanated from the flawed recommendation of 5th and 6th CPC. Now that the 7th CPC recommendations would be taken up for implementation, the need for a forum to discuss these issues, especially Departments specific matters need not be emphasized. 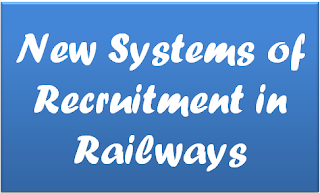 The untenable restriction imposed by the government i. e. 5 percent of the vacancies for Compassionate Appointments in Departments other than Railways has created innumerable difficulties and arbitrary discrimination. The very fact that the said government orders have no sway to half of the civilian employees makes the orders discriminatory and bereft of any merit. The specious plea of the Government that the said orders were issued on account of a directive from the Supreme Court was later found to be fallacious. On various occasions, the Staff Side was assured of a review of the scheme. The scheme requires simplification and has to be made non-discriminatory too. We want the above two issues to be discussed at your level and reach a settlement. We shall be grateful if you will afford us an opportunity to have such a discussion on a date convenient to you. We shall also be thankful if you can indicate the date of the meeting atleast 15 days in advance. Fifth Set of Frequently Asked Questions (FAQs) was issued yesterday clarifying certain issues relating to Income Declaration Scheme,2016 (the Scheme). Clarification has been sought as to whether the answer number 4 of the said FAQ shall apply to all assets declared under the Scheme or it is limited to only immovable property. As explained in the said answer, the clarification was issued considering the fact that investment in an immovable property may be funded partially from undisclosed and partially from disclosed sources. In such cases, if the property is sold in near future, gains from part of the property may be long term and the balance may be short term. This shall cause undue hardship to the declarant. 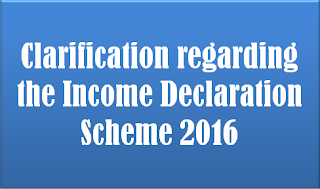 Therefore, the clarification issued relates only for determination of holding period of immovable property. In view of the above, it is again clarified that answer number 4 of the said FAQ shall only be applicable for determining holding period of an immovable property for which the date of acquisition is evidenced by a deed registered with any authority of the State Government. However, for assets other than immovable property declared under the Scheme, the holding period shall start from 01.06.2016 for purpose of computation of capital gains. She Also Creates History by Becoming The First ‘Women Wrestler’ From India to Bag an Olympic Medal. Indian Railways’ employee Sakshi Malik has won the first Olympic medal at Rio Olympics 2016 for the country. Minister of Railways Shri Suresh Prabhakar Prabhu, Minister of State (Independent charge) for Communications & Minister of State for Railways Shri Manoj Sinha and Minister of State for Railways Shri Rajan Gohain have congratulated her for making the country proud by her achievement. Entire Indian Railways fraternity is also feeling proud today, as Indian Railways has brought laurels for the nation. Sakshi Malik won the Olympic Bronze medal in 58 kg category of women’s freestyle wrestling. 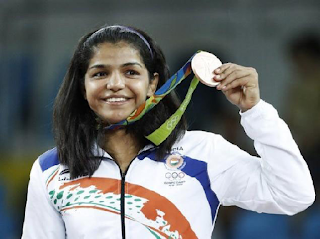 Sakshi Malik also created history by becoming the first ‘women wrestler’ from India to bag an Olympic medal. Gritty women wrestler, Sakshi Malik ended India’s anxious wait for a medal by clinching the bronze in the 58 kg category, pulling off a sensational 8-5 victory over Alsuluu Tynybekova of Kyrgyzstan in the play-off bout. Another Indian Railway Employee Vinesh Phogat, who was also a medal hopeful in the 48 kg category was forced to retire hurt earlier after a promising display. It will be worthwhile to point out that it was Indian Railways which took lead in raising the entire women wrestlers team of India for the first time and in a way provided a new career option and a sports to Indian women in the field of wrestling. Sakshi Malik is presently working in the commercial department of the Delhi Division of Northern Railway. Indian Railways facilitated grooming of Sakshi Malik as an ace wrestler by providing all kinds of facilities, environment and incentives. The wrestling coach of Indian Railways Shri Kuldeep Malik worked hard to prepare the Railway women wrestlers for the mega event of the Olympics. The sports directorates of Indian Railways coordinated her training with the Ministry of Sports & Youth Affairs at all stages. As per the announcement made earlier by the Railway Minister Shri Suresh Prabhakar Prabhu before the commencement of the Games, she will be awarded Rs. 50 lakh and will be promoted as a Gazetted officer and will be posted in the Zonal Railway of her choice. Indian Railways has rich tradition to provide all out support for promoting sports & sports persons. Indian Railways has always been on forefront of sporting activities in the country. Over the years, right from the inception, Indian Railways sports persons have represented India in the Olympics, the Asiad and other International meets with great success. Almost one third of Indian contingents at Rio comprises of Railway sportspersons, which is by far the highest in any Olympics and thus showing Railways’ resolve to promote sports in the country. The sports persons nurtured by Indian Railways have proved their metal from time to time and brought laurels to the country. A delegation of the Central Secretariat Stenographers' Service (CSSS) Association, called on the Union Minister of State (Independent Charge) for Development of North Eastern Region (DoNER), MoS PMO, Personnel, Public Grievances, Pensions, Atomic Energy and Space, Dr Jitendra Singh here today and sought his intervention for parity in pay fixation and related issues. The delegation led by Shri Raj Kishore Singh submitted a memorandum listing details of their long pending issues and suggesting options to resolve the same. According to the memorandum, while applying Rule 8 of CCS (RP) Rules 2008, the pay of direct recruits and new entrants is fixed at higher stage, when compared to the existing employees who were promoted in the same grade. This leads to discrimination in the fixation of pay of Personal Assistants of one category vis-à-vis the other category. The memorandum also stated that the issue has been lingering on in the National Anomaly Committee for the last four years, but it has not been addressed. It pleaded that the mechanism of grant of “stepping up” to certain employees should be provided only in exceptional cases and not resorted to as a routine matter to sort out discrepancies which may affect a large number of employees. 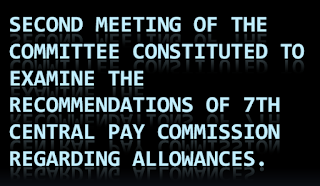 Members of the delegation suggested that their issue can be addressed by incorporating a new provision in the Rules wherein if a promotee’s pay is getting fixed at a stage lower than that of a direct recruit, then the pay of the promotee should be fixed at the same stage as that of a direct recruit / new entrant. 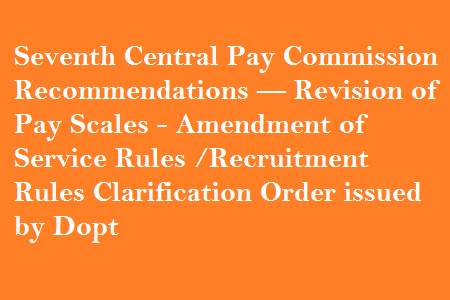 The other option suggested by them was to amend the CCS (RP) Rules so as to appropriately fix the pay in the Pay Band for a particular post carrying a specific Grade Pay. Dr Jitendra Singh gave a sympathetic hearing to the members of delegation and assured them that DoPT will try to sort out their issue to the maximum extent possible. 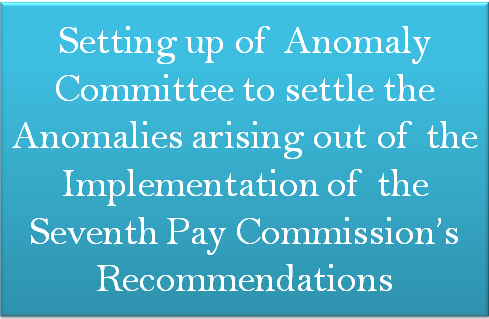 (5) The Anomaly Committee shall receive anomalies through Secretary, Staff Side of respective Council upto six months from the date of its constitution and it will finally dispose of all the anomalies within a period of one year from the date of its constitution. Any recommendations of the Anomaly Committee to resolve the anomaly shall be subject to the approval of the Government. (8) Orders regarding appointment of the Arbitrator and constitution of Anomaly Committee at National Level will be issued separately. 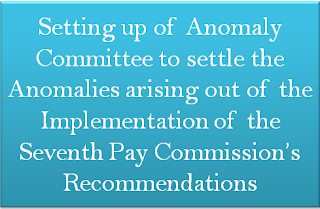 All Ministries / Departments are accordingly requested to take urgent action to set up the Anomaly Committees for settlement of anomalies arising out of implementation of the 7th Pay Commission’s recommendations, as stipulated above. 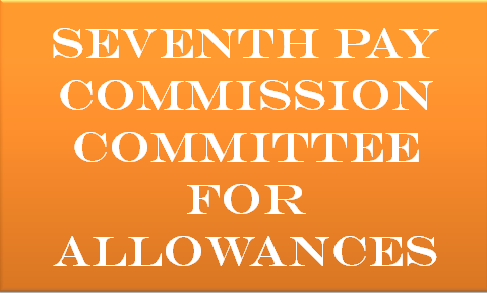 The Seventh Pay Commission submitted its report to the Central Government in November 2015. Among the most eagerly-anticipated topics was the recommendations regarding the House Rent Allowances. Typically, an employee spends more than a third of his/her salary on house rent. Keeping in mind this huge and unavoidable expense for Central Government employees living in major cities, the Sixth Pay Commission had recommended that 10, 20 and 30 percent of the Basic Pay be given as HRA. 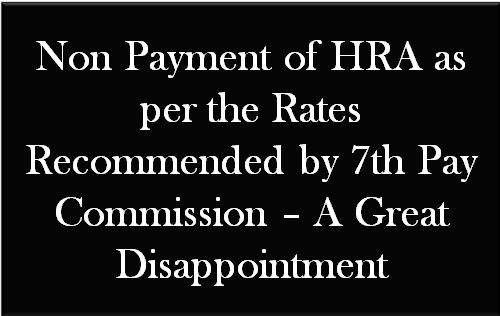 The various Central Government employee unions and Federations requested the Seventh Pay Commission to recommend to the government that the percentage of HRA be increased. 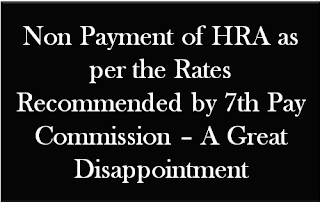 To everybody’s surprise, the Seventh Pay Commission recommended that the government reduce the HRA to 8, 16, and 24 percent. Although many reasons were given for this recommendation, the employees were hugely disappointed. Since the recommendations will be applied for the next ten years, there was a strong demand for the previous HRA levels to continue. As a consequence, all the Central Govt Employee’s Federations began to put pressure on the Central Government to increase the percentage of HRA. This also became one of their most important demands. 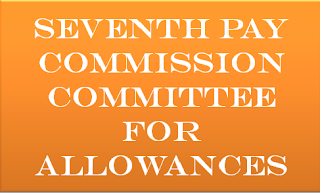 The Central Government, meanwhile, bought time for itself by announcing the formation of an Empowered Committee to look into the recommendations of the Seventh Pay Commission. There is no news about the Empowered Committee report, as of this date. On June 29, the central cabinet gave its approval to the recommendations of the Seventh Pay Commission. It was announced that a committee would be constituted under the leadership of the Finance Secretary, to look into the issue of various allowances, including the HRA. The committee would be advised to present its report in four months. 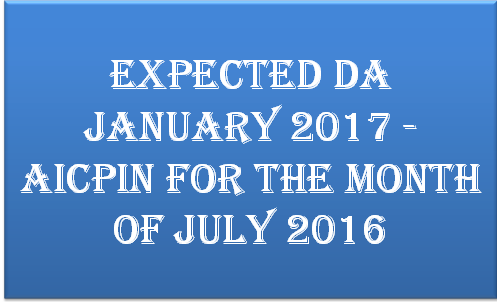 Until then, HRA will be issued as per the pre-revised pay and rates. During the negotiations that were held to prevent a nationwide indefinite strike(July 11), this issue was discussed in detail. The government agreed to constitute a high-level committee. It was said that the government had “indirectly accepted” the recommendations made by the high-level committee regarding the HRA. On July 25, the government confirmed the implementation of the Seventh Pay Commission by publishing it in the official Notification & Gazette. There was no change regarding the HRA. The employees meanwhile recollect, with surprise, the four months’ time that was given to the special committee for discussing the HRA issue. 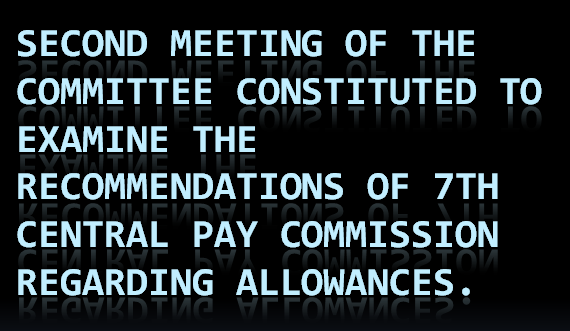 The announcement that the Sixth Pay Commission recommendations will be followed until the committee announces its decision, is considered to be the biggest disappointment of them all. HRA plays the most important role in salary increment. The employees feel that as per the percentages recommended by the Seventh Pay Commission, the HRA should be given from this month’s salary onwards. Some feel that the arrears in the HRA could have been paid later. Why is the government hesitating to implement it? Ref: Our letter of even No. dated 26.7.2016. We solicit your kind reference to the discussion, the representatives of NJCA had with you in the presence of the Honourable Home Minister, Shri Rajnath Singh and the Railway Minister, Shri Suresh Prabhu and the MOS (R) Shri Manoj Sinha on 30th June, 2016. 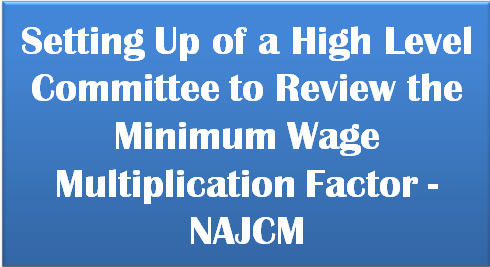 We were expecting a quick action on the part of the Government to operationalise the assurance of setting up a high level Committee 10 go into the Minimum wage, Multiplication factor etc. However, we are disappointed that even after a lapse of more than a month no order has been issued by the Government in this regard. The employees, as you are aware, were angry over the arbitrary determination of the minimum wage by the 7th CPC by mutilating the Dr. Aykhroyd formula and also the propornate multiplication factor. We, therefore, appeal to you that the concerned authorities may be asked to expedite the issuance of orders setting up the committee and finalization of the Report within the available time of remaining three months. On 12th August, 2016, we have met the Secretary Pensions to convey our strong resentment over the decision to allow the Option No. 1 given to the pensioners to be implemented subject to feasibility. We have reiterated that while we are open to discussion as to the methodology of verification of the claims of individual petitions in respect of Option No.1, we would not be able to countenance of the non implementation of the recommendation of the 7th CPC on the flimsy ground of non availability of records. In the meantime, we must endeavour to support the one day strike action slated for 2nd September, 2016 for which the call has been given by the Central Trade Unions (including independent Federations) to the best of the ability of the respective organizations as the objective of the strike is the betterment of the working people in our country. (d) the reasons for delay in this regard? A statement is laid on the Table of the House. 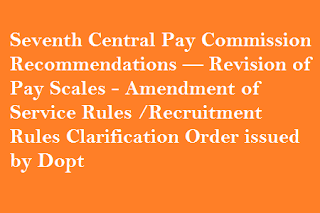 (a) to (d): The Government has decided to implement the recommendations of the 7th Central Pay Commission relating to pay, pension and related issues. The resolution on Government decisions has been issued on 25.07.2016. 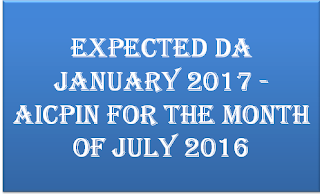 The matters relating to pay and pension, as decided by the Government, have been implemented with effect from 01.01.2016. In view of the significant departure from the existing provisions recommended by the 7th CPC and a number of representations received from Employee Associations and other stakeholders in this regard, the Government has decided that recommendations on allowances, other than Dearness Allowance, be examined by a Committee comprising Finance Secretary as Chairman and Secretaries of Home Affairs, Defence, Health and Family Welfare, Personnel & Training, Posts and Chairman, Railway Board as Members for examination before taking a final decision. The Committee has been asked to submit its report within four months. 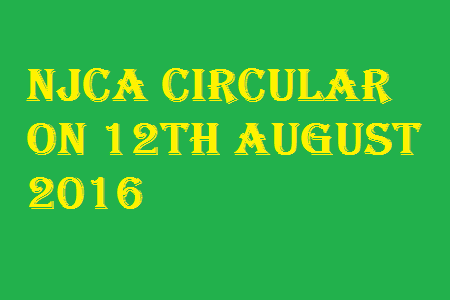 This Committee has been constituted on 22.07.2016 and the first meeting of the Committee has been held on 04.08.2016.
i. One of the passengers booked on the ticket has to show the prescribed proof of identity (in original) during journey failing which all the passengers booked on that ticket are treated as travelling without ticket and charged accordingly. ii. No refund is granted on cancellation of confirmed Tatkal ticket. iii. The facility of change of name is not permitted on the booking made under Tatkal Scheme. iv. The timings of opening of booking under Tatkal scheme on the opening day of reservation have been staggered to 1000 hours & 1100 hours on the previous day of journey from train originating station for AC and non-AC classes respectively. v. Authorised ticketing agents have been restricted from booking Tatkal tickets during the first thirty minutes of opening of Tatkal booking i.e. from 1000 hours to 1030 hours and from 1100 hours to 1130 hours. vi. 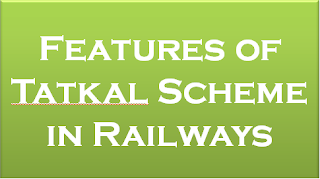 Web service agents have been permitted to book only one Tatkal ticket per train per day. vii. Maximum four passengers per PNR for Tatkal Tickets. Individuals are allowed only 2 Tatkal tickets per IP Address from 1000 hours to 1200 hours permissible and maximum number of tickets allowed to an individual user is 6 per month. viii. Automatic log out after completion of one transaction. Whenever any instance of misuse of Tatkal scheme was brought to the notice, the root cause for such misuse was examined and remedial steps were taken by modifying the provisions of the scheme to plug the loopholes. Centralized statistics, State/Union territory wise regarding instances of such misuse is not maintained. 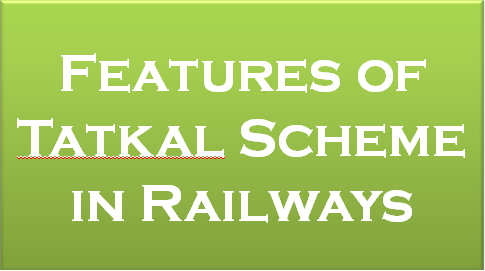 However, since 2014 till date, instructions regarding modification in Tatkal scheme have been issued on six occasions. This Press Release is based on the information given by the Minister of State for Railways Shri Rajen Gohain in a written reply to a question in Lok Sabha on 10.08.2016 (Wednesday). The Department of Administrative Reforms and Public Grievances has created an online Centralized Public Grievance Redress and Monitoring System (CPGRAMS) on which grievances can be lodged from anywhere, anytime by an aggrieved citizen regarding deficiency in public service delivery. Some of the grievances lodged on CPGRAMS could also be due to the petitioner not being satisfied with the efficiency or behaviour of the Government servants. 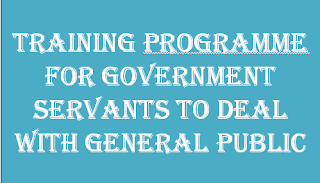 Development of professional, impartial and efficient civil service, which is responsive to the need of the citizen is the objective of the National Training Policy adopted in April 1996 and reviewed in the year 2012. Some of the key initiatives under the National Training Policy are Mid Career Training Programme (MCTP) for IAS officers to handle the next higher level of responsibilities, Domestic Funding of Foreign Training (DFFT) to upgrade the knowledge and skills of IAS, CSS, State Civil Services and Group ‘A’ Officers working under the Central Staffing Scheme, long term domestic post graduate programme to enhance the competence of mid career civil servants, Advanced Professional Programme in Public Administration (APPPA) to prepare the senior civil servants for better governance with focus on citizen services and on the job in house one hour weekly training for better skill and efficiency in dealing with the demands of work place. This was stated by the Union Minister of State (Independent Charge) Development of North-Eastern Region (DoNER), MoS PMO, Personnel, Public Grievances & Pensions, Atomic Energy and Space, Dr. Jitendra Singh in a written reply to a question by Shri Anubhav Mohanty in the Rajya Sabha Yesterday. 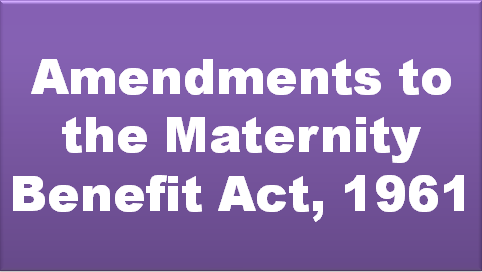 The maternity benefit Act 1961 protects the employment of women during the time of her maternity and entitles her of a 'maternity benefit' - i.e. full paid absence from work - to take care for her child. The act is applicable to all establishments employing 10 or more persons. The amendments will help 1.8 million (approx.) women workforce in organised sector. 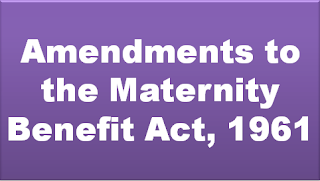 • 12 weeks Maternity Benefit to a 'Commissioning mother' and 'Adopting mother'. • Facilitate'Work from home'. 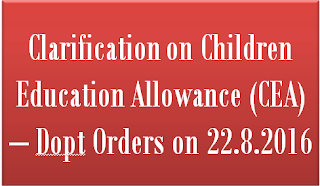 • Mandatory provision of Creche in respect of establishment having 50 or more employees. • Maternal care to the Child during early childhood - crucial for growth and development of the child. 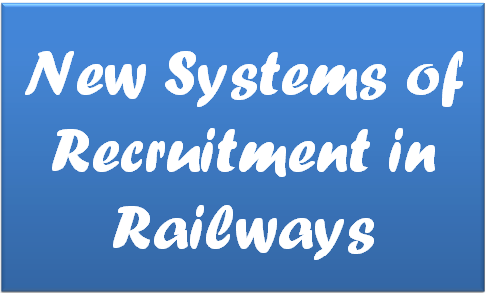 To reduce the time gap to fill up the vacancies in Railways, systems of ‘Online Applications’ and ‘Computer Based Tests’ (CBTs) in recruitment for Group ‘C’ and erstwhile Group ‘D’ posts, have been introduced through a series of pilot projects. Under this system, examination for 54 categories of Senior Section Engineers (SSEs) and Junior Engineers (JEs) have been conducted successfully in 2015. Based on the success of Computer Based Tests for SSEs and JEs, CBTs have also been conducted in three more subsequent examinations i.e. Special Recruitment Drive (SRD) for Persons with Disabilities (PWDs) for Non-Technical Popular Categories (NTPC) Under-Graduate Level, NTPC Graduate Level posts and another SRD for PWDs for erstwhile Group ‘D’ posts. This Press Release is based on the information given by the Minister of State for Railways Shri Rajen Gohain in a written reply to a question in Lok Sabha on 10.08.2016 (Wednesday). Special Concessions to Central Government Employees working in Kashmir Valley in attached/subordinate offices or PSUs falling under the control of Central Government. Subject:- Special concessions to Central Government Employees working in Kashmir Valley in attached/subordinate offices or PSUs falling under the control of Central Government. The undersigned is directed to refer to this Department's O.M. No.18016/3/2011-Estt. 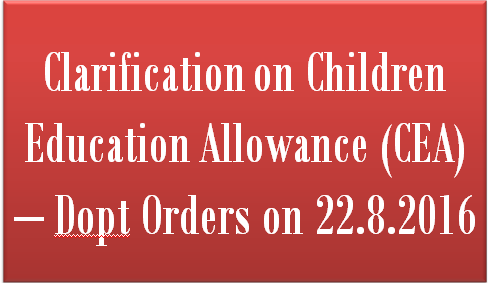 (L) dated 20th April, 2015 on the subject mentioned above and to state that it has been decided by the competent authority to extend the package of concessions/incentives to Central Government employees working in Kashmir Valley for a further period of two years w.e.f. 01.01.2016. The package for two years is as per Annexure. 2. The package of incentives is uniformly applicable to all Ministries/ Departments and PSUs under the Government of India and they should ensure strict adherence to the rates prescribed in the package. The concerned Ministry/Department may ensure implementation and monitoring of the package in conformity with the approved package, and therefore, all Court cases in which verdicts are given contrary to the package would have to be contested by the Ministries/Departments concerned. 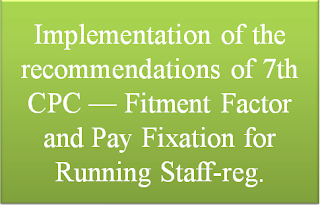 Implementation of the recommendations of 7th CPC — Fitment Factor and Pay Fixation for Running Staff-reg. 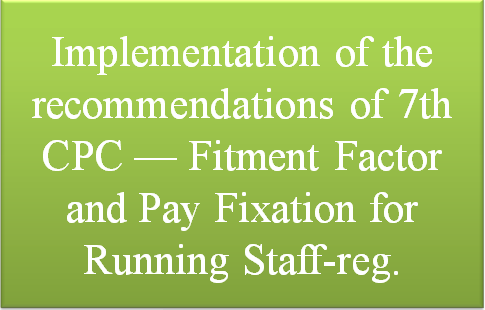 Sub: Implementation of the recommendations of 7th CPC — Fitment Factor and Pay Fixation for Running Staff-reg. Ref: (i) NFIR’ s letter No. IV/NFIR/7CPC(Imp)/2016/R.B. dated 13/07/2016. (ii) Board’s letter No. PC-VII/2016/RSRP/2 dated 02/08/2016 (RBE No.93/2016). The Federation vide its letter dated 13/07/2016 requested the Railway Board that in view of 30% pay element of Running Staff needed to be taken for arriving at the “multiplier factor”, it was suggested to maintain the same at “3” instead of “2.57”. Federation is however disappointed to note that the Railway Board instead of following the simple procedure has complicated and mutilated the pay fixation formula/procedure of Running Staff as per illustration given in Annexure ‘C’ of Board’s letter No. PC-VII/2016/RSRP/2 dated 02/08/2016 (RBE No. 93/2016). 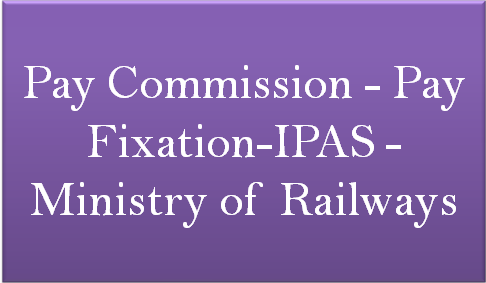 In this connection, the Federation brings to the notice of the Railway Board that in the Resolution circulated by the Ministry of Finance (Department of Expenditure) vide No. 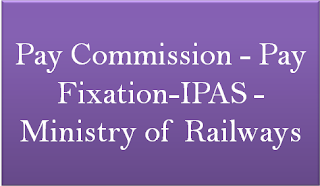 12/2016-IC on 25th July 2016 in Para 12, it has been mentioned that in respect of Railway employees to whom Running Allowance is admissible, it will be ensured that the actual rise in pay at the time of initial fixation is about 14.29% as recommended by the Pay Commission. Federation feels sad to convey that the said decision of the Ministry of Finance has not been complied with by the Railway Ministry particularly in respect of Running Staff. In case of Running Staff with Rs.1000/- Basic Pay, he will get Dearness Allowance Rs.1,625/-, thus, the total would be Rs.2,625/-. In terms of Gazette Para 12, minimum benefit 14.29% should be given to Running Staff. 14.29% of Rs.2,625/- is Rs.375/-. Thus Basic Pay + Dearness Allowance + Minimum Guaranteed Benefit = 1000 + 1625 + 375 = Rs.3,000/-. From this, it is clear that the Running Staff having Basic Pay of Rs.1000/- should be fixed at Rs.3000/-. But in the illustration given in RBE 93/2016, Running Staff with Basic Pay of Rs.19,930/- is fixed at Rs.58,694/-, which works out 12.19% which is clear violation of Para 12 of Gazette Notification. In view of the above, the Annexure of Board’s letter dated 02/08/2016 is needed to be redrawn to ensure justice to the Running Staff. NFIR, therefore, requests the Railway Board to consider the above points and issue modification immediately duly endorsing copy to the Federation. 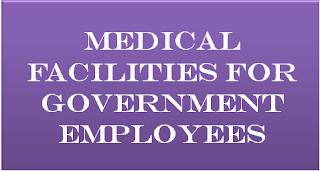 Will the Minister of HEALTH AND FAMILY WELFARE be pleased to state the details of medical facilities being provided to Central Government employees? (i) Central Govt. 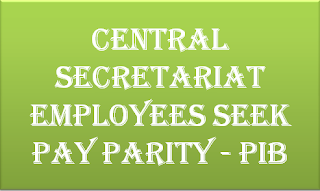 employees drawing their salary from Central Civil Estimates of Government of India are covered under Central Govt. Health Scheme (CGHS) in the cities where CGHS is in operation. 4. Investigations at Govt. and empanelled Diagnostic centres. 5. Medical consultation and dispensing of medicines in Ayurveda, Homeopathy, Unani and Siddha systems of medicine (AYUSH). 6. In case of emergency, CGHS beneficiaries can go to any hospital, empanelled or non-empanelled and avail medical treatment. 7. Reimbursement of expenses for treatment in Private unrecognized hospitals in case of emergency. 8. The beneficiary can go to any CGHS Wellness Centre in the country. 9. Reimbursement of expenses incurred for purchase of medical equipments such as hearing aid, hip/knee joint implants, artificial limbs, pace makers, ICD/Combo device, Neuro implants etc., as per the CGHS ceiling rates and guidelines. 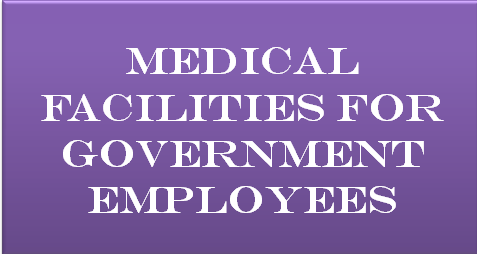 (ii) Central Government employees who are not covered under CGHS are provided medical facilities under Central Service (Medical Attendance) Rules, 1944. They can avail treatment from Central Government / State Govt. Hospitals and hospitals recognised by the State Govt./CGHS/CS (MA) as well as the hospitals fully funded by either Central Govt. or the State Govt. with the approval of the Head of the Department on the basis of medical prescription issued by the concerned Authorized Medical Attendant.